Targeted Business School Education that Keeps Pace with today's business landscape! A business school degree or certificate program from Grantham University’s Mark Skousen School of Business could be just what you need to pursue any number of career opportunities in the corporate world. "Business and financial operations are projected to add more than 1.3 million jobs between 2014 and 2024." At Grantham University, each undergraduate and graduate online business degree and certificate program is designed to give you the targeted, highly relevant education you need to become a leader and make a difference in your chosen field. From the full-time working parent to active-duty military personnel looking for a transition plan, now is the time to pursue your online business degree from Grantham University. 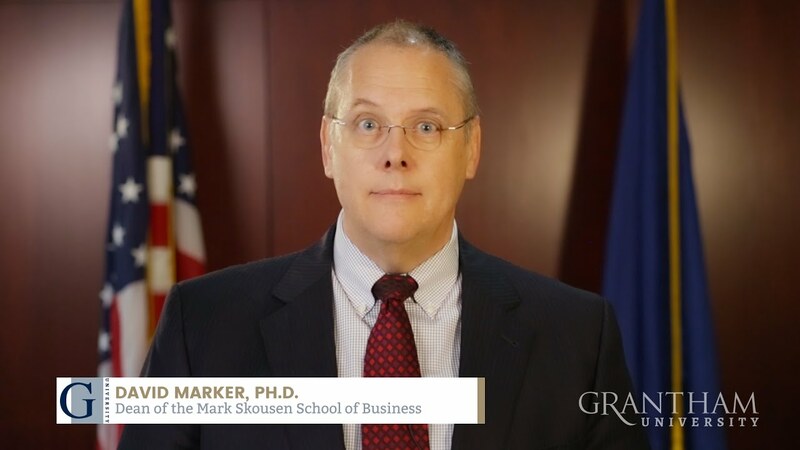 A MESSAGE FROM THE DEAN David Marker, Ph.D.
Hi, I’m David Marker, and I am the Dean of the Mark Skousen School of Business. I want to thank you for taking the time to learn more about our programs. As you explore the school, you will find we offer a broad range of online business degrees, human resource and finance related degree and certificate programs – all guided by credentialed faculty with practical experience in a number of industries. They’re here to help you understand the rules, the techniques and the vocabulary of business. From accounting to project management, you’ll learn what it takes to be successful at every stage of your business career. And that’s the key, really. We want you to succeed. That’s why we adhere to the VIP Squared support system of instruction. At Grantham, we’re committed to being Visible, Immediate, Personal and Proactive – helping you to stay on track and cross the finish line. So do your research. Look at our programs. Ask questions. We’re here to help – just a click away. It is the mission of the Mark Skousen School of Business to develop entrepreneurially minded business students by providing innovative pedagogical methods through a student-centered approach to learning that leads to a high-quality, relevant and sustainable business foundation. Grantham University has received specialized accreditation for its business programs through the International Assembly for Collegiate Business Education (IACBE) located at 11374 Strang Line Road in Lenexa, Kansas, USA. The business programs in the following degrees are accredited by the IACBE. Coursework for the Bachelor of Business Administration - Human Resource Management program has been acknowledged by the Society for Human Resource Management (SHRM) to fully align with SHRM’s HR Curriculum Guidebook and Templates.